At first glance, the ants have to bring country site only benefit, as they eat different kinds of pests. But if you have to deal with a large nest, these insects begins to assume a tangible harm. Ants in small quantities, of course, can bring vegetable plot favor. Because they feed on slugs, caterpillars and other insect pests that eat garden plants. Around the nest, the soil becomes more fertile, about 10 times enriched in phosphorus. All is good that can come from ants. But all this is true only if the anthill of small size. Ants love the sweet nectar secreted by the plants. Sweet pad is also able to form and some insects feeding on plant SAP. For example, one such insect is the aphid, mealybugs and scale insects. And here the problem starts with the ants as they carry aphids on young and healthy plants, you can say "graze" it. To get the sweet nectar, they are trying to protect their "herd" of aphids. If the plants showed this problem, then you must find somewhere nearby anthill. Many ways of combating garden ants are inconclusive. Worker ants to destroy it makes no sense, since the uterus quickly restore the population of the colony. Therefore, it is difficult to deal with ants. But not everything is so bad, effective ways of dealing with insects still exist. The supporters of chemicals can create a special bait that contains intestinal poison. These funds operate very effectively and quickly. However, the use of poison on the ground which later will be grown plants is quite undesirable, this is of little use. In addition, the poisons acting on the ant, can destroy other beneficial insects. Many folk remedies used by gardeners, is completely ineffective. For example, creating a sweet bait will destroy only the worker ants but will not affect the colony itself. The most humane way to get rid of ants on your site, is the transfer of an anthill. Doing this is really hard, and the earth from the anthill will be sitting on a few hundred meters from private plot. This is done as follows: first, a shovel is necessary to remove the loose top of the anthill and pour it in a bucket. The ants fled, the capacity prudently closed with a lid. You then need to dig the ground under the nest and also place it in the bucket, just cover with lids. The nest usually takes a meter in depth, so we need to dig until, until you find eggs. Land with an anthill is carried away from the site. That insects are able to recover the anthill in the first place from buckets poured earth with eggs. On top falls loose part. Small nests can be dig, but after two weeks everything will be restored and the ants dwell in the old place. Therefore, it is necessary to know how to deter insects. 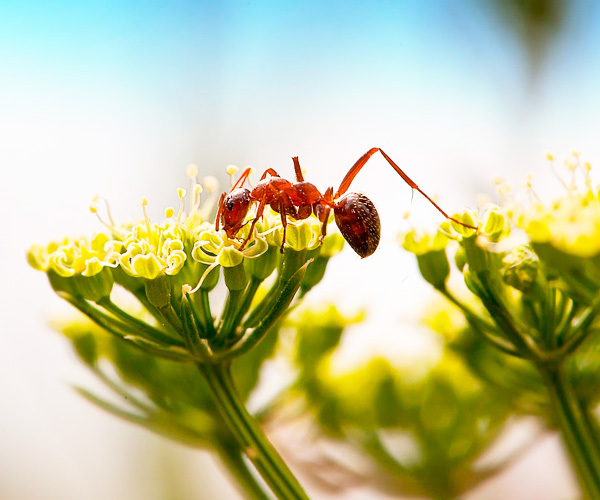 Ants don't like a lot of odors, particularly garlic and onions. Not to allow them to climb on shrubs and trees, you can tie the trunks of the broken arrows of garlic. If there are not arrows, tree trunk, you may simply grate the garlic. Scatter pieces of garlic around it makes no sense, because ants will carry the source of the hated the smell away. The head of rotten fish or herring is another great option of getting rid of ants. Fish can be left on an anthill, or doomed it somewhere near. Ants can't carry such a big subject, so they would have to get away from the unpleasant odor. On the trunks of shrubs and trees can be put on some sort of skirts made of tin or foil. This protection is placed on the base of the shrub or tree. The ants can't climb over the edge of the cut, as it is too thin, so the aphids will not spread. The nest can be filled with boiling water and it will give the result, but only with regular repetition. Some gardeners heat the sunflower oil and pour them all the passages in advance by removing the aboveground part of the nest. Killing ants on the plot is bait, prepared with water, sugar and yeast. The resulting slurry was placed in a matchbox and place near anthill. This tool is able to banish ants from the area. Ways of dealing with ants invented a great many, but not all of them gives a positive result. Many ways have to be regularly repeated to keep bugs away. Because of their multiplicity, fight extremely hard, but it is possible with the right motivation.